ArchiveMac is an application for Mac OS X Leopard which supports archiving large files to CD and DVD. 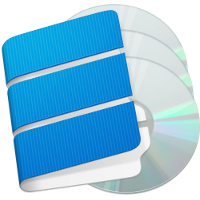 It splits large files and directories across multiple discs if needed. When restoring, the original file or directory is restored regardless of how large it is. There is no file or directory size limit. September 2009: Release 1.2.7. Bug fix on 64 bit Snow Leopard machines. Is your hard drive filling up with huge media files? Have you run out of room because of large video files? Need a way to save those precious memories that fill up your drive with files that are too big to archive to a DVD? ArchiveMac allows you to archive your files to CD and DVD so that you can free up space on your hard drive. Is your Time Machine backup volume filling up? When it does, Time Machine will warn you that it needs to delete old backups. What if you want to keep a record of old versions of files before they are deleted forever? Should you backup or archive? Backing up is when you save everything on your hard drive so that you can recover in the event that your hard drive fails. However, no matter how large your hard drive is, eventually you accumulate too many files and fill up your drive. Backing it up won't help, you simply have too much data. Archiving is when you move data from your hard drive to somewhere more permanent but not as accessible. Typically this means offloading data from your hard drive onto optical discs. Once you've created your archive, you can free up space on the hard drive. Doesn't Leopard include CD burning? Finder is able to burn to optical disc, however it can be cumbersome to use. If you try to write more data than fits on a single optical disc, you have to manually try and decide which files to put where. That can be quite a headache if you have lots of files to keep track of. Worse, there is no way in Leopard to write a file to optical disc which is larger than the disc. If you're backing up to CD, what do you do with your 800MB video file? 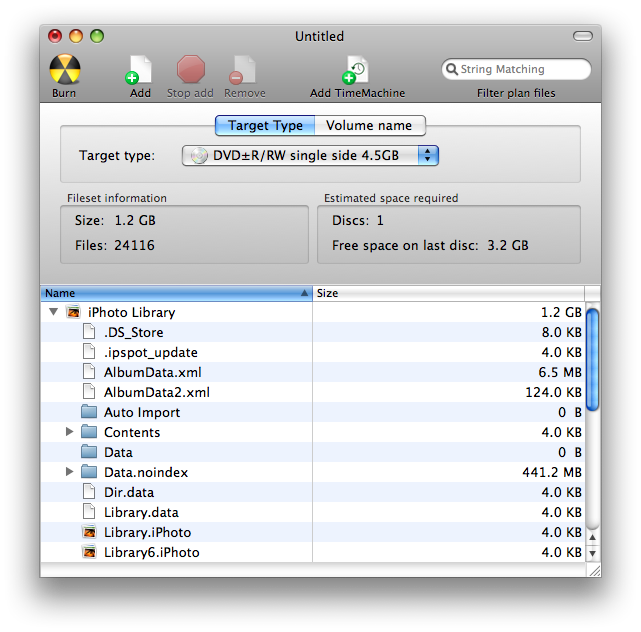 ArchiveMac can create multi-disc archives, allocating files to each disc to fill them up. It is able to split large files so that portions of the file reside on as many discs as necessary. There is no size limit on directories nor files. Some video recorders generate 20GB+ files. Thats an enourmous file taking up room on your hard drive. But you may not want to lose that file. If you compress the file, artifacts are introduced and you can never recreate the original. ArchiveMac lets you save these large files and get them off your hard drive. ArchiveMac is the perfect complement to Time Machine. Leopard's Time Machine handles your backup needs, but doesn't help offload your hard drive when its simply too full. 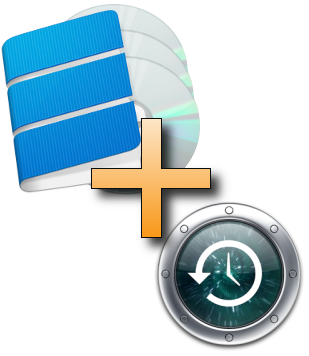 ArchiveMac is the archival solution working to complement Time Machine providing your archival needs while Time Machine handles your backups. 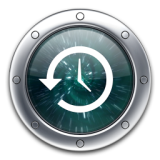 Time Machine maintains multiple versions of its backup, as long as space permits on the backup drive. When the drive fills up, Time Machine starts deleting the oldest versions. There may be previous versions of files that you want to keep around. ArchiveMac helps you find and archive files from within your Time Machine backups. "I've done spanning for more years than I care to remember... ArchiveMac is the absolute best solution I've ever seen, and I've seen a lot of them...ArchiveMac is essential to my workflow"
"works like a charm!...you have a fantastic product here and i've been looking for this type of app for literally about 8 or 9 years now...your app is a breath of fresh air, light-weight, simple and fast." "I just bought ArchiveMac yesterday and burnt about 25 DVDs already. It is working great and is a huge time saver... I like the automatization your app offers me. It's wonderful." "Overall ArchiveMac is a great program that is easy to use and very helpful in keeping your files safe..."
"ArchiveMac receives an outstanding score of 10/10 for ease of use"
Download the fully functional free trial of ArchiveMac to see how it can provide your archival solution. Spans large files and directories across any number of discs. Choose which discs to burn in a set. Can skip or reburn any disc. No file or directory size limit. Discs can be read using Windows Vista, Windows XP sp2, and Linux. Files can be restored on Mac OS X using Finder and command line tools if ArchiveMac unavailable. List of files in archive stored on each disc enabling easy searching. Supports CD-R, CD-RW, 650 and 700MB. Supports DVD ±R, ±RW, -DL. 4GB and 8.5GB.